Book Lovers 4Ever: GHOULISH by Kat Bellamy BLOG TOUR & Giveaway !!! 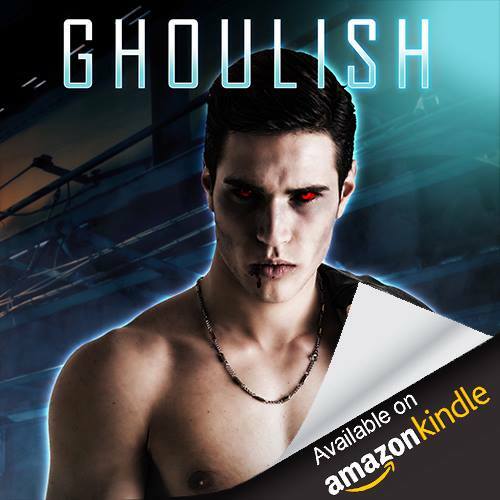 GHOULISH by Kat Bellamy BLOG TOUR & Giveaway !!! The next book will be available for review January 2018. Colt Jager never knew what happened to the parents who abandoned him, and he never cared--until he inherited their ghoulish secret. Raised as a human who had no idea he was anything but a blue-collar construction worker until the night of his 25th birthday, Colt finds it hard to adjust to life in the Kinship, a hidden world woven discreetly into human society. After a grisly encounter with his true nature, Colt meets a family of human-friendly ghouls who teach him that there's a way to be inhuman without being inhumane. But things get complicated when he realizes that the "wolf attack" responsible for killing his boyfriend's brother was actually committed by a ghoul on the hunt. When an elite family of especially monstrous ghouls called Alphas threatens the man he loves, Colt will have to lie to Jason to keep him safe. Can a predator ever truly be a hero, or will the man he loves become his prey? "You could help people lots of ways. I just don't see why you have to pick the one that could get you killed." "I'll be pushing papers for the DA, not infiltrating a crystal meth ring,” Jason shot back. “And what happens if some psycho gets pissed at your boss for putting him in jail and you get caught in the crossfire?" "Then I'll have a hard time holding water." "I'm glad you find this so funny." "Colt," Jason pleaded, taking Colt's face in his hands. "It was a joke." "I guess I just don't find the very real possibility of losing you all that funny." Jason's face fell. "I'm sorry," he said softly. "But I can't give up on my dream. Not even for you." Colt clenched his jaw. "Why is this so important to you? Why does it have to be this field?" Jason settled back against the couch with a heavy sigh. "You remember how it was when Luca was killed. We all spent months reeling, grasping for something to make sense of what happened. I'd listen to my dad reaming out Fish and Wildlife reps for hours on end, demanding reports and explanations for how a lone wolf in an area where there wasn't supposed to be anything other than coyotes and fisher cats just showed up and killed his son. It made no sense, and we desperately needed it to, even though we knew logic wouldn't bring him back. It wasn't until I got older that I realized there are some things in this world you just can't make sense of. Things that you can't explain no matter how hard you try, and even if you could, it wouldn't change anything. But there are tragedies that can be explained, and there are families out there who suffer needlessly until someone finds the answers. I want to be one of the people who finds those answers, Colt. I don't want anyone else to feel the way my family did if it can be helped." Colt’s stomach churned as Jason spoke. The conviction in Jason's voice alone was enough to soften his anger, but more than that, it was the doubt it caused in Colt that unsettled him. What if it hadn't been a wolf that attacked Luca, after all? Colt had never questioned the official narrative as a preteen, but knowing what he knew now as an adult, “animal attack” rang as nothing more than a callous euphemism. If one of his own kind had killed Luca, keeping this secret about his own identity was more than just a lie. It was a betrayal.